Korolev 3000 km range intermediate range ballistic missile. Developed April 1947 to 1949 before cancellation. AKA: 8A67. Status: Cancelled 1949. Payload: 3,000 kg (6,600 lb). Thrust: 1,370.00 kN (307,980 lbf). Gross mass: 71,720 kg (158,110 lb). Unfuelled mass: 8,480 kg (18,690 lb). Specific impulse: 285 s. Specific impulse sea level: 244 s. Burn time: 150 s. Height: 33.00 m (108.00 ft). Diameter: 2.80 m (9.10 ft). Span: 2.80 m (9.10 ft). Development of the long-range R-3 missile was authorized at the same time as the V-2-derived R-1 and R-2 rockets in April 1947. Supplemental authorization was contained in a government decree of 14 April 1948.The specification was an order of magnitude leap from the other vehicles - to deliver a 3 metric ton atomic bomb to any point in Europe from Soviet territory - a required range of 3000 km. To achieve this objective innovative technology was needed in every area of the missile design. Korolev was again in direct competition with the design to the same specification of the captured Germans (Groettrup's G-4). ILN - A winged rocket to extend the range, as on the German A4b. But compared to a ballistic missile this required solution of new technical problems in guidance, high-temperature materials, and hypersonic aerodynamics. A winged separable warhead section. This would have less weight than the winged rocket approach, but required extensive research in the same technical areas. KS - A two-stage high-speed cruise missile. Both rocket and ramjet propelled cruise stages were considered. Either would use the R-3A as the booster to achieve Mach 3 and ramjet ignition. BN - A conventional missile - single stage for the R-3 3000 km range missile, and two stage or drop tanks for the follow-on 8000 km range missile. This was the best solution for the 3000 km range requirement, but would require extensive redesign to achieve 8000 km range. A 'packet' scheme - parallel staging of similar or identical rocket stages. This was considered the best alternative for an ICBM. M K Tikhonravov in fact proposed an ICBM consisting of three R-3's - two lateral R-3's as the first stage, surrounding an R-3 second stage core vehicle. Reduction in empty mass fraction by a factor of three from that of the R-2. This was to be achieved through use of integral propellant tanks; deletion of aerodynamic stabilizers (orientation of the statically unstable missile using a single gimbaled engine); and a structure of a new lightweight aluminum alloy. Improvement of engine specific impulse by 22%. 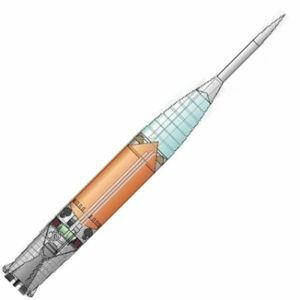 The engine would use Lox/Kerosene propellants, and provide a lift-off thrust of 120 metric tons and a vacuum specific impulse of 288 seconds. Both Glushko (RD-110) and Polyarniy (D-2) engine designs were considered. The Glushko engine was an analogue to the V-2 engine - 19 of the seven-metric ton thrust combustion chambers designed by the German engineers feeding a single large 'mixing' chamber. Polyarniy proposed an engine using unspecified 'new principles'. Korolev proposed use of the more conservative Glushko engine. Use of a separable warhead for improved accuracy. This included Korolev's preferred 'high-speed tip' warhead shape. This was tested on the R-1A rocket series beginning on 4 May 1948. Lift-off mass would be 71.72 metric tons, with a burnout mass of 8480 kg. The warhead would separate at a velocity of 4700 m/s in order to achieve the 3000 km range. An alternative heavy 12 metric ton warhead could be boosted to a 1000 km range. Barmin's GKB Spetsmash would provide the V-2-like mobile launcher. So much new technology was involved that it was deemed necessary to build an R-3A intermediate experimental rocket, based on the R-2. This would be flown to test new construction methods, guidance systems, and high energy propellants. The R-3A would have a 900 to 1000 km range with a payload of 1530 kg; an unfueled mass of 4100 kg; 20,500 kg of propellants; and a lift-off thrust of 40 metric tons. The R-3A could also serve as a prototype for a more modest IRBM. The draft project was completed by Korolev in June 1949. In November 1949 the project plan was submitted to the NTS (Scientific-Technical Soviet) of NII-88 for review. The NTS met in plenary session on 7 December 1949 and subjected the proposal to withering criticism. The R-3A technology demonstrator would be built and flown under Project N-1. An IRBM missile using a new, lighter nuclear warhead could be developed from this (the R-5). Under Project N-2 both the RD-110 and D-2 engines would proceed into development test in order to prove Lox/Kerosene propellant technology. Packet rocket and lightweight structure research for use in an ICBM would continue under project N-3 / T-1. Winged intercontinental cruise missile studies would continue under project N-3 / T-2. Guidance system development for long range systems would be undertaken by the Pilyugin and Ryazanskiy bureaus. Parallel work was done by Konoplev at NII-20. The system used gyroscopic guidance supplemented with radio-controlled engine cut-off to improve accuracy. Development of the R-5 IRBM (1425 kg warhead over a 1200 km range) using improved V-2 and R-3A technology. Development of the R-11FM submarine-launched ballistic missile (970 kg payload over a 150 km range). Work proceeded on the R-3 themes with significant German input, although they were not allowed to know how the work was going. Detailed technical questions were continued throughout 1950-1951, coming almost daily by March 1951. Meanwhile Glushko was unable to overcome mixing chamber instability in his 19-burner RD-110 engine concept. Further development of both the Glushko and Polyarniy engines was discontinued in 1951. Work on the R-3A continued - another period of intense questioning of the Germans came in June 1952, when it seemed to them that a test flight of the R-3A was imminent. But in the end, the decision had actually been made to proceed directly to the R-7 ICBM. During development the range of the R-3A had settled on 935 km with only a 500 kg payload. It was cancelled in October 1951 without ever flying, with the technology being applied to further R-5 and R-11 development. The R-3 was completely cancelled, and a Soviet 3000-km IRBM did not appear until Yangel's R-14 entered service in 1962. Stage 1. 1 x R-3. Gross Mass: 69,000 kg (152,000 lb). Empty Mass: 5,480 kg (12,080 lb). Thrust (vac): 1,370.000 kN (307,980 lbf). Isp: 285 sec. Burn time: 150 sec. Isp(sl): 244 sec. Diameter: 2.80 m (9.10 ft). Span: 2.80 m (9.10 ft). Length: 27.10 m (88.90 ft). Propellants: Lox/Kerosene. No Engines: 1. Engine: RD-110. Status: Development 1949. Comments: 3000 km range IRBM design to study problems of long-range rockets. Developed April 1947 to 1949 before cancellation. Family: IRBM. Country: Russia. Engines: D-2 engine, RD-110. Propellants: Lox/Kerosene. Agency: Korolev bureau. Bibliography: 283, 394, 475, 476, 89. 1949 June - . Launch Vehicle: R-3. R-3 draft project completed - . Nation: Russia. Related Persons: Korolev. In selecting a final R-3 design, Korolev's preferred approach was a conventional single-stage design. This was down-selected within the bureau and seems to have borrowed a lot from contemporary classified US orbital rocket designs..